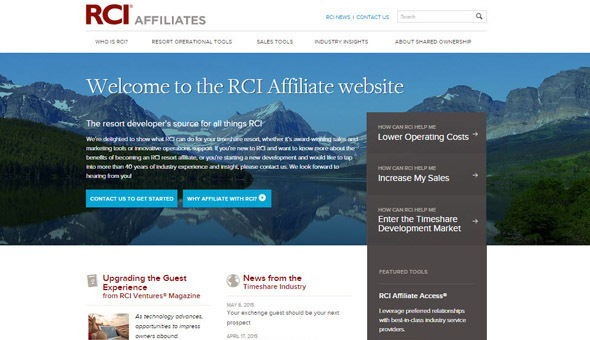 RCI recently released an enhanced version of its website for affiliated developers and resort staff, RCIAffiliates.com. The enhancements include three new components that affiliates will notice: 1) A new look and even more intuitive navigation; 2) New content that serves as an industry news resource; and 3) Responsive design for easy mobile viewing. The new look and feel makes navigating the website easier than ever before. With a streamlined design, affiliates will be able to find materials they need to help them run their businesses, including RCI Affiliate Access® information, HOA management resources, RCI® Online Tour Generation, and much more. As RCI continues to innovate and produce added services for affiliates, they will be able to find all of the information in this one-stop-shop site. Next up, the updated site includes a section for industry news, articles and content. With this, RCI aims to provide an online news hub for affiliates who want to find the most recent updates and information, including articles from RCI Ventures®magazine and blog posts. Lastly, the site now has a responsive design that makes it easily viewable on a multitude of devices. Just as timeshare consumers are looking for information 24/7 from anywhere they are, RCI understands that affiliates are running their businesses the same way. Now affiliates can access the documents and information they need while on the go, no matter what device they are using to view it. For more information, visit RCIAffiliates.com. RDO6 ‘Embracing Change’ – Embracing the Millennials…..